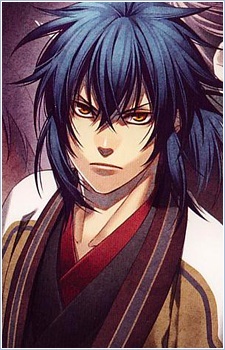 Main character of Hakuoki Reimeiroku. Although he's obstinate and badmouthing, he also has a gentle side. After his mother died of illness, he lost his goal and wandered around aimlessly. He was raided by a group of sonnō jōi rōnins heading towards Kyoto, robbed of all his money, and left him to die. When he was about to starve to death, he was saved by Serizawa Kamo. In exchange for saving him, Ryunosuke is forced to become Serizawa's servant. The place he is taken to is the quarters of a group of rōnins who will eventually be known as "Shinsengumi." Although he was also born in a samurai family, because of what he's been through, Ryu hates "samurai" with a passion. But now he lives with a bunch of youngsters whose lifetime goals are to become samurais. As stubborn as Ryu is, after getting to know them better, and understanding their dreams, his heart begins to change.